Welcome back safe and sound! I was a little worried there for a bit. Based on the crying all the pundits, pollsters and biased talking heads were apparently doing last night you would have to assume the end of the world was at hand. Now, I say apparently because I chose to spare myself all the hoopla of a Hillary win based on the all the information coming at me around noon yesterday – the last time I bothered to check the news. Instead, I worked on wiring my garage and watched a pretty good movie – fittingly, Purge the Election Year. I gave strict orders for no one to give me any updates and to their credit they stuck to their word (even my wife who I know must have been dying to tell me by the time she went to bed). At 5:40 this morning, Linda gave me the news and to say I was shocked is a huge understatement. I would put it more in the lightning strike to the head level made up of 50% jolt and 50% uncontrolled happiness. Don’t get me wrong, Trump wasn’t my guy, but compared to the most corrupt candidate to ever run for the highest office in the land … he’s a godsend. I have to give President Elect Trump credit. He took on a boat load of challengers, fought back against the establishment (of both parties), paved his own path and came out the end a winner. Flyover country has awakened (link here) and they are taking their country back. Note, to all the hack celebrities, comedians and singers that promised to leave the country should the election turn out the way it did, your names are all on a list sitting next to my desk and recommend you order your U-Haul pronto – Cher might need a rocket to go where she promised. Time will tell how this turns out, but in honor of Trump’s tenacity I give you today’s featured bird. However, when you get a little closer..
Hit the jump to learn a bit more about this bird .. and, of course, a few more shots. The start to take on a very different persona. That hooked bill and the bandit eye coloring tend to give this bird a more devious impression. 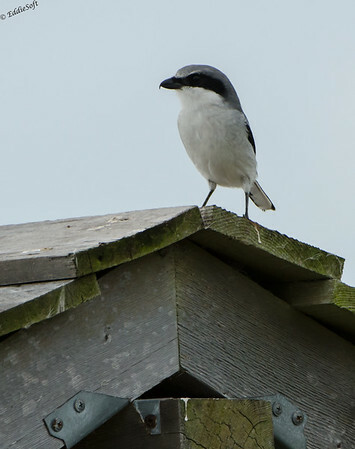 This perspective is a much more accurate reflection of this bird, the Loggerhead Shrike. In case you are wondering, the name Loggerhead is synonymous with blockhead and refers to the larger size of the head in relation to the body. Kind of hard to tell from the head on shot, but it really stands out in the profile view – also take note of that sharp hook on the end of the beak. That slicing weapon is called the tomium and has a pair of sharp projections referred to as the tomial teeth. I expect full credit when you impress all your friends and family on the aviary category at your next trivia night. Cornell informs us that these projections are likely used to paralyze their prey with a vicious strike to the spinal cord. Before you cringe, this might actually be a mercy kill for their victims. Remember when I stated they have a devious or more accurately a cruel chain in their DNA? 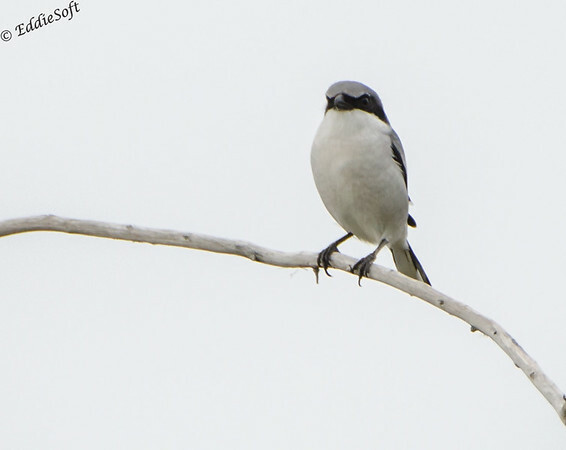 Yes, I am talking about that cute bird pictured above – don’t be fooled by that “Who me look?” If I get time, I may petition to have this Shrike renamed Vlad. You may think that is odd, but these stone cold killers have a tendency to impale (yes, you read that correctly) their victims on thorns or barbed wire. Yep, grab that small bird, butterfly or grasshopper and ram it into a spike for future feasting. Personally, it seems this might also be a sign to other birds of prey to keep their distance. Nothing says “head a different direction” than victims lined up like enemies of the Lannisters in Game of Thrones. For the record, I’m super stoked to have this bird in the tin. He was shot on our birding trip to Texas back in November 2013. That trip is definitely producing a good number of new check marks for my birding list. As it appears we have run out of pictures, thought I would leave you with one more cool fact. 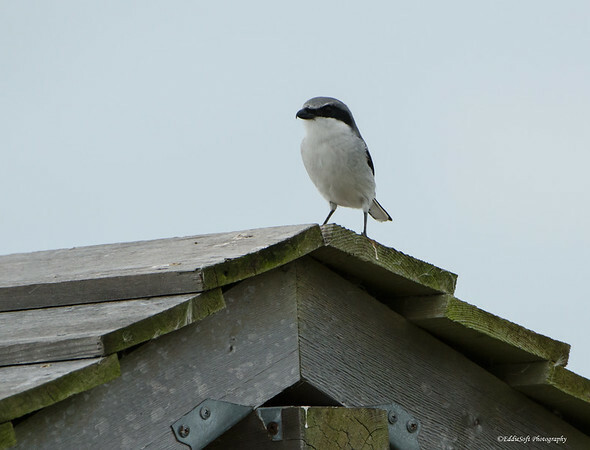 These Shrikes are able to include poisonous food sources into their diet. They simply leave them impaled on the thorns for a number of days until the poison breaks down naturally. By the way, thanks to this post, I just learned that Monarchs are apparently noxious. All I have for you tonight – hope you enjoyed my latest addition to my collection. Texas, eh? Not countable, then, as I reported in an earlier post due to annexation issues that linger. Nice pictures, though, that would have been nice additions to your bird count if it were allowed. 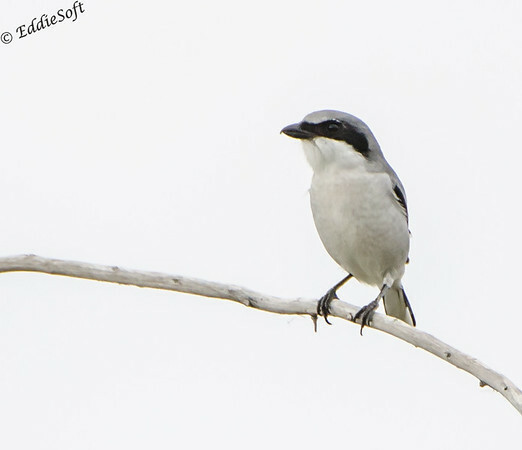 You didn’t mention that the Northern Shrike is found up here, the main difference being that the mask narrows more or even disappears over the beak. Same sadistic streak. 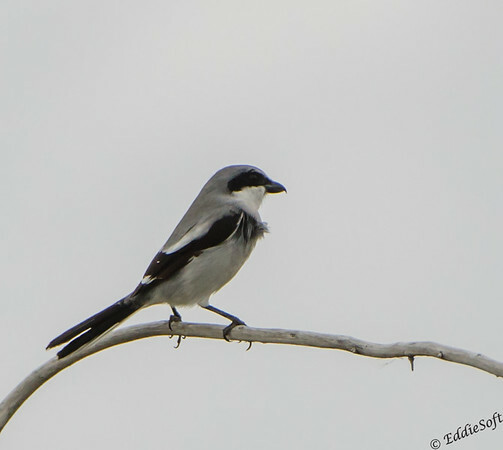 I really like these birds, and I took a lot of pictures of a Loggerhead Shrike in Fort Myers a couple weeks ago, and another one last May in the same location. They have a tendency to perch high, fly off at prey, and then return to the same two or three perches, which is quite camera-friendly of them. I haven’t seen the prey impaled on Hawthorns or barbed wire, but I know they do this and have seen pictures of it. Thanks again for a cool post on an ultra-cool bird! Again, Texas birds are COUNTABLE – it is California the jury is still out on. To be honest, you really have to look at that mask with a close eye to see the difference. Like the Carolina Chickadee, the best way to be sure is to go to a region where the other one isn’t around to guarantee which one you have. You are welcome – thank you for the barrage of comments as of late – appreciate it!